There also have been recent arrests of other Cuban dissidents. On December 18, in Santiago de Cuba, the police raided the headquarters of the Patriotic Union of Cuba (UNPACU) in Santiago de Cuba and eight other homes of activists in that city, Havana and Palma Soriano. A total of 115 UNPACU dissidents were arrested. This included their leader, Jose Daniel Ferrer. As of December 20, several were still detained and two, Lisandra Rivera Rodríguez and José Luis Álvarez Chacón, were allegedly charged with alleged “attempted” crimes. In addition, the police seized UNPACU laptop computers, CDs, cell phones and other equipment used by the dissidents. Members of another dissident group, Ladies in White, were arrested this past Sunday and prevented from attending mass at a Catholic church, and on December 20 more than 40 such members were detained and prevented from attending a Literary Tea in Central Park in Old Havana. A prior post discussed the raid and arrests at Cubalex. Ferrer, UNPAC and the homes of several activists, Diario de Cuba (Dec. 18, 2016); The regime breaks its own repressive marks: 115 UNPACU activists were detained on Sunday, DiariodeCuba (Dec. 20, 2016); Some 30 Ladies in White arrested in Havana and Matanzas, Diario de Cuba (Dec. 18, 2016); More than 40 Ladies in White detained in Havana to prevent them from attending a literary tea, DiariodeCuba (Dec. 20, 2016). 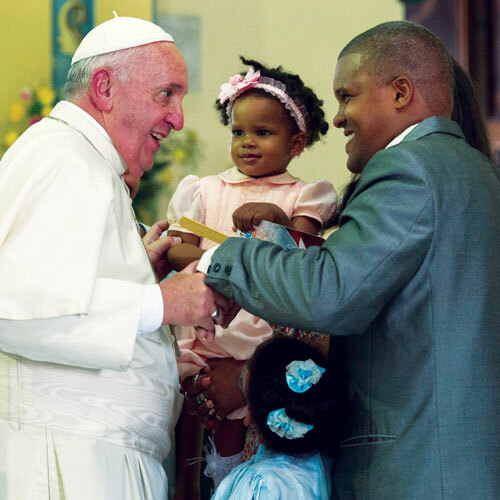 Pope Francis’ fourth and last day of his mission to the Cuban people (Tuesday, September 22) was spent that morning in and near Santiago de Cuba, at the eastern end of the island. At the Basilica of Our Lady of Charity of El Cobre, a small village just outside Santiago, Pope Francis celebrated mass. Above are photographs of the Pope at the mass and of the Basilica. Here is the text of his homily. Following the Mass, the pope traveled to Santiago in the popemobile, waving to throngs lining the streets. 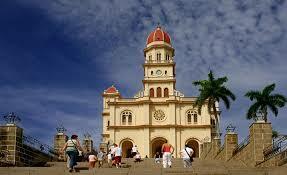 In the Our Lady of the Assumption Cathedral of Santiago, he met with families. Below our photographs of the Pope at this Cathedral. Santiago, in eastern Cuba, also carries deep ideological symbolism as the birthplace of Fidel Castro’s revolution in the 1950s. From the very same balcony just used by Francis, for example, Fidel in 1959 proclaimed the victory of the Revolución. After I have written about Francis’ mission to the American people, I will study and pray about Francis’ remarks to the two peoples in order to make my own analysis of these wonderful missions by a humble, merciful, charming man of God. 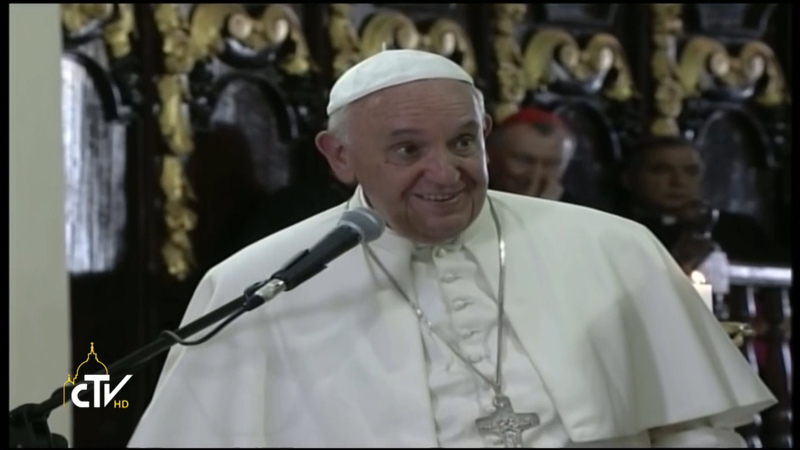 Montgomery & Miroff, Pope wraps up Cuba visit with call for ‘revolution of tenderness,’ Wash. Post (Sept. 22, 2015); Pope Francis in Cuba: Minute by minute, Granma (Sept. 23, 2105); Pope Francis reflects on blockade of Cuba, Granma (Sept. 23, 2015); Pentin, Full Text of Pope’s Homily at Shrine of Our Lady of Charity of El Cobre, Cuba, Nat’l Cath. Reg. 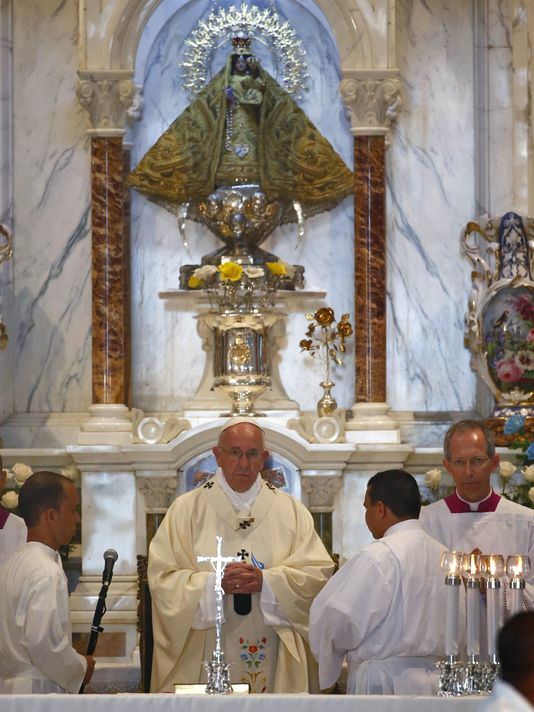 (Sept. 22, 2015); Jervis, The pope pays a visit to El Cobre and the Virgin Mary, USA Today (Sept. 22, 2015); Pope Francis in Cuba—Holy Mass at the Shrine of Our Lady of Charity of El Cobre, Vatican Radio (Sept. 22, 2015)(video); Text of the Pope’s speech to families in Santiago, Cuba, Rome Reports (Sept. 22, 2015); Pope in Cuba: ‘A Child Is a Source of Hope. . . I Bless the Children in the Womb,’ Nat’l Cath. Reg. (Sept. 22, 2015). Previous posts have covered Pope Francis’ first, second and third days of his mission to the Cuban people.